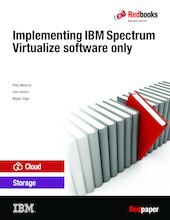 This IBM® Redpaper™ publication provides a broad understanding of IBM Spectrum Virtualize™ software only and how it fits into to the IBM SAN Volume Control and IBM Storwize® families. It also provides use cases for cloud, Cloud Service Provider (CSP), and Managed Service Provider (MSP) implementations. This publication helps storage and networking administrators install, tailor, and configure IBM Spectrum Virtualize software only. It also provides a detailed description of supported hardware and troubleshooting tips. In April 2017, this paper was updated to include information about Version 7.8.1 and Supermicro SYS-2028U-TRTP+ server implementation.